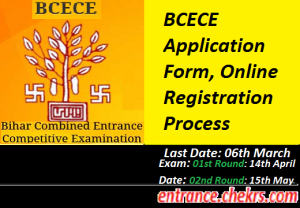 BCECE Application Form (बीसीईसीई आवेदन फार्म) 2017: Bihar Combined Entrance Competitive Examination Board conducts this entrance examination for enrolling eligible candidates into various classroom engineering programs. For participating in the admission process, applicants have to register themselves online from bceceboard.com/. The online submission of BCECE 2017 Application Form has been started from 14th February 2017 and the candidates meeting the eligibility norms in all the aspects are invited to register online until 06th March 2017 and after that the hard copy of the completely filled BCECE Online Registration Form 2017 is needed to be submitted to the mentioned address on or before 20th March 2017. The applicant must be a subject of India. Applicant should be 12th pass from a certified board of India with minimum aggregate 45% marks. The students must have the study of Physics, Chemistry, and Maths as compulsory subjects. There will be an age limit for the applicant. Every year this entrance examination is conducted for providing new admissions to the deserving candidates in the classroom undergraduate engineering programs. The applicants have to submit the BCECE Online Form 2017 on or before the application submission deadline, i.e. 06th March 2017 and then they have to submit the hard copy of the online application form to the given address until 20th March 2017. Applicants will able to fill the application form on official website of BCECE. Before proceeding towards the Bihar Combined Entrance Competitive Exam 2017 Application Form submission, applicants need to satisfy the eligibility criteria in all the aspects. Candidates have to fill the application form to take participant in the entrance examination. Candidates are advised to follow the step-wise procedure given below to register online for Bihar BCECE. Applicant needs to visit the official website of BCECE Board, i.e. bceceboard.com/. Now click on Online Application link after visiting the official notification and meeting the eligibility norms. Fill all the required entries in the online form. Attach the scanned copies of all the necessary documents in the application form. Recheck all the filled entries and click on submit key. The BCECE notification has been announced by Bihar Combined Entrance Competitive Examination Board on the official website, you can check the notification by following the link just above. The online submission of BCECE Application Form 2017 has been started from 14th February 2017 and online applications will be accepted until 06th March 2017. After the successful submission of online form, candidates need to submit the hard copy of the online form along with the application fee slip to the address mentioned above on or before 20th March 2017. The examination is basically a state level examination for undergraduate applicants admission. For any type of assistance, while submitting the Bihar BCECE Registration Form 2017, you are invited to contact us by leaving your comments at the end of the post.